This year marks the tenth anniversary of the opening of the Miura Ayako Literature Museum in Asahikawa, the author's birthplace and lifelong home. 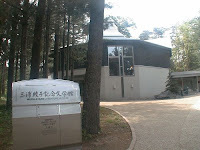 The attractive building that houses the exhibits, library, and meeting rooms is nestled in a corner of the actual forest that was the setting for Miura's best-selling debut novel Hyoten. The museum has a website (Japanese only) packed full of information ranging from descriptions of the author's works to museum-sponsored events. Of particular interest to fans and students of Mura's novels, are the lectures given by prominent scholars and literary critics on many of her works, including some of the lesser-known short stories. As the number of visitors from outside of Japan increases, so has the number of language support services offered by the museum. Besides being known as the "entrance" to Daisetsuzan National Park, the city of Asahikawa boasts the award-winning Asahiyama Zoo, the Snow Crystal Museum, the Yukara-ori Folk Craft Museum, and many other places that make Miura's hometown worth the detour on any trip to Hokkaido. It is open everyday between June 1 to September 30, 2009. At other times of the year, it is closed on Mondays, and if Monday is a holiday, it is closed on the following Tuesday instead. The entrance fee for adult visitors is 500 yen.